"This is the thing, you see: I am on my way to being an old man. But at 60, I am still the youngest of old men." As Ian Brown's 60th birthday loomed, every moment seemed to present a choice: confront or deny the biological fact that the end was now closer than the beginning. True, he was beginning to notice memory lapses, creaking knees, and a certain social invisibility - and yet it troubled him that many people think of 60 as "old", because he rarely felt older than he had at 40. An award-winning writer, Brown instead chose to notice every moment, try to understand it, capture it...all without panicking. 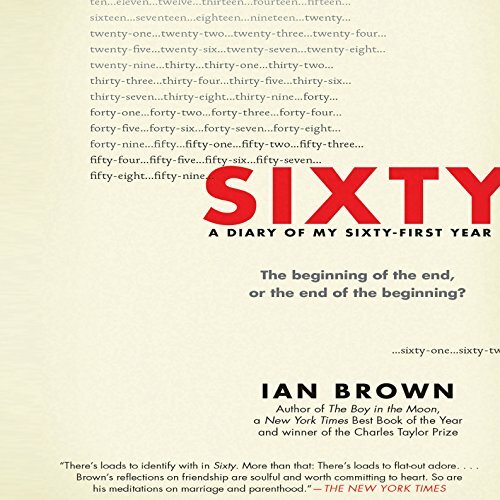 Sixty is the result: Brown's uncensored account of his 61st year and, informed by his reportorial gifts, his investigation of the many changes - physical, mental, and emotional - that come to all of us as we age. Brown is a master of the seriocomic, and his day-to-day dramas - as a husband, father, brother, son, friend, and neighbor - are rendered, inseparably, with wistfulness and laugh-out-loud wit. He is also a discerning, prolific reader, and it is a pure pleasure being privy to his thoughts on the dozens of writers - including Virginia Woolf, Philip Larkin, AJ Liebling, Wislawa Szymborska, Clive James, Sharon Olds, and Karl Ove Knausgaard - who speak to him most at 60. From an author on whom the telling detail is never lost, Sixty is a richly informative, candid report from the line between middle-aged and soon-to-be elderly. It perfectly captures the obsessions of a generation realizing that they are no longer young. ©2016 Ian Brown (P)2017 Audible, Inc. This is a dark and depressing look into the author’s life and his expectations for life after 60. He bemoans just about everything regarding growing old and his lot in life. This is against a back drop of long wonderful trips and interesting experiences. Yuck … skip this one!